Zelda II: The Adventure of Link[a] is an action role-playing video game with platforming elements. The second installment in The Legend of Zelda series, it was developed and published by Nintendo for the Family Computer Disk System on January 14, 1987, less than a year after the original The Legend of Zelda was released and seven months before North America saw the release of the first Zelda title. The game was released in North America and the PAL region for the Nintendo Entertainment System in late 1988, almost two years after its initial release in Japan. The Adventure of Link is a direct sequel to the original The Legend of Zelda, again involving the protagonist, Link, on a quest to save Princess Zelda, who has fallen under a sleeping spell. The Adventure of Link's emphasis on side-scrolling and role-playing elements was a significant departure from its predecessor. For much of the series' three decade history, the game served as the only technical sequel to the original title, as all other entries in the series were either prequels or occurred in an alternative reality, according to the official Zelda timeline. This eventually changed with the release of The Legend of Zelda: Breath of the Wild in 2017, which serves as the latest chapter in the overall continuity. The game was a critical and financial success, and introduced elements such as Link's "magic meter" and the Dark Link character that would become commonplace in future Zelda games, although the role-playing elements, such as experience points, and the platform-style side-scrolling and limited lives have not been used since in canonical games. The Adventure of Link was followed by The Legend of Zelda: A Link to the Past for the Super Nintendo Entertainment System in 1992. Zelda II: The Adventure of Link is an action role-playing game bearing little resemblance to the first game in The Legend of Zelda series or later games in the series. The Adventure of Link features side-scrolling areas within a larger top-down world map rather than the exclusively top-down perspective of the previous title. The side-scrolling gameplay and experience system are similar to features of the Castlevania series, especially Castlevania II: Simon's Quest (also released for the Family Computer's Disk System peripheral in 1987). The game incorporates a strategic combat system, a proximity continue system based on lives, an experience points (EXP) system, magic spells, and more interaction with non-player characters (NPCs). Apart from the non-canonical CD-i The Legend of Zelda games, Link: The Faces of Evil and Zelda: The Wand of Gamelon, no other game in the series includes a life feature. The side angle was used again in Link's Awakening and the other Game Boy entries, but was not the main angle in those games, which relied primarily on the top-down view. In this installment, Link gains experience points to upgrade his attack, magic, and life by defeating enemies. He can raise each of these attributes to a maximum of eight levels. Raising a life level will decrease the damage Link receives when hit, raising a magic level will decrease the magic points (MP) cost of spells, and raising an attack level will strengthen his sword's offensive power. Each attribute requires a different amount of experience to level up, with the life level requiring the least number of points to level and attack requiring the most. When enough points are acquired to raise an attribute, the player may choose to level up that attribute or to cancel and continue gaining experience points towards the next level in another attribute. Once Link has raised an attribute to the maximum level of eight, further advances in that attribute will earn Link an extra life, without advancing the attribute itself. Link begins the game with four Heart Containers and four Magic Containers and can acquire up to four more of each, permanently increasing his life points and magic points respectively. Other games in The Legend of Zelda series only allow Link to increase his strength through new weapons, items, and Heart Containers. Certain enemies drain Link's experience when they attack, but he will never lose a level once raised. When a game ends or is saved, the cartridge records Link's current ability levels and the number of experience points required for the next increase, but resets his accumulated points to zero. The Adventure of Link plays out in a two-mode dynamic. The overworld, the area where the majority of the action occurs in other The Legend of Zelda games, is still from a top-down perspective, but it now serves as a hub to the other areas. 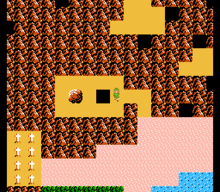 Whenever Link enters a new area such as a town, the game switches to a side-scrolling view. This mode is where most of the action takes place, and, with the exception of traveling across lava and water, it is the only mode in which Link can take damage and be killed. Link also enters this mode when attacked by wandering monsters. Whenever the player traverses the various environments of Hyrule, enemy silhouettes appear and pursue him. Of the three random creatures that appear, there are three types which correspond to the relative difficulty of the monsters in battle mode: a small, weak blob denoting easy enemies, a large, strong biped denoting harder enemies, and a Fairy, which will put Link on a single screen with a free Fairy to refill his health. This separate method of traveling and entering combat is one of many aspects adapted from the role-playing video game genre. Stepping onto particular spots in the overworld map will automatically switch the game to a side-scrolling mode for an enemy encounter or item pickup. The Adventure of Link has a more complex combat system than its predecessor. Armed with a sword and shield, Link must alternate between standing and crouching positions to attack enemies and defend himself; for example, the Iron Knuckle enemy changes the height of its attack and its shield depending on Link's current stance, forcing Link to change stances until he has a chance to attack safely. Link has the ability to jump, which can be used for attacking tall or airborne enemies, and can be used for evasion. Eventually, he can learn techniques for midair downward and upward stabs. Though Link must still collect several items in order to progress in the game (as in the previous and subsequent installments of the series), these special items grant abilities which either remain in permanent use for the rest of the game or can only be activated in the overworld. In place of actively used items, The Adventure of Link features eight spells for Link to use during action scenes. Each spell is learned from a different wise man in one of the eight towns within Hyrule. Link often has to complete side-quests, such as retrieving lost items, before they will teach him their spells. Some spells and items are necessary for advancing in the game. Also, the Life spell becomes the main means of recovering health during action scenes, since healing Fairies are only found in rare fixed spots and only appear randomly as overworld encounters. Like its predecessor, The Adventure of Link allows storing up to three games in the cartridge's memory. Once the game has been completed, selecting the corresponding file in the main menu allows starting a new game preserving the acquired experience levels, techniques, and magic spells (but no special items, Heart and Magic containers, or extra lives, which must be obtained again). Several years after the events of The Legend of Zelda, the now-16-year-old Link notices a strange mark on the back of his left hand, exactly like the crest of Hyrule. He seeks out Impa, who takes him to the North Castle, where a door has been magically sealed for generations. Impa places the back of Link's left hand on the door, and it opens, revealing a sleeping maiden. Impa tells Link that the maiden is Zelda (not the Zelda from the first game), the princess of Hyrule from long ago, and the origin of the "Legend of Zelda". Zelda's brother tried to force her into telling their recently deceased father's secrets concerning the Triforce. Princess Zelda refused to reveal its location, and the prince's wizard friend, in anger, tried to strike her down with a spell. Zelda fell under a powerful sleeping spell, but the wizard was unable to control the wildly arcing magic and was killed by it. The prince, filled with remorse and unable to reverse the spell, had his sister placed in the castle tower, hoping she would one day be awakened. He decreed that princesses born to the royal family from that point on would be named Zelda, in remembrance of this tragedy. Impa says that the mark on Link's hand means that he is the hero chosen to awaken Zelda. She gives Link a chest containing six crystals and ancient writings that only a great future king of Hyrule can read. Link finds that he can read the document, even though he has never seen the language before; it indicates that the crystals must be set into statues within six palaces scattered all over Hyrule. This will open the way to the Great Palace, which contains the Triforce of Courage. Only the power of the combined Triforces can awaken Zelda. Taking the crystals, Link sets out to restore them to their palaces. Meanwhile, Ganon's followers seek to kill Link, as sprinkling his blood on Ganon’s ashes will bring Ganon back to life. Ultimately, Link restores the crystals to the six palaces and enters the Great Palace. After venturing deep inside, Link battles a flying creature known as Thunderbird, followed by his shadowy doppelgänger Dark Link. Link then claims the Triforce of Courage and returns to Zelda. The three triangles unite into the collective Triforce, and Link's wish awakens Zelda. The game ends as they (presumably) kiss under a falling curtain. Shigeru Miyamoto, the creator of the original The Legend of Zelda, intended to make Zelda II: The Adventure of Link fundamentally different from its predecessor. A different team was assembled to develop the game. However, Miyamoto (who was credited under the pseudonym "Miyahon") was the producer, and Takashi Tezuka returned to write the story and script. Zelda II: The Adventure of Link was directed by Tadashi Sugiyama (credited as "Sugiyan"), for whom it was the first project at Nintendo. Rather than Koji Kondo composing the sequel, Akito Nakatsuka (credited as "Tsukasan") composed the music. The Adventure of Link was originally released on the Family Computer Disk System (FDS) before its worldwide release. Like its predecessor, the FDS version appears to be an earlier version of the game, with a few obvious differences. In the English release, the dungeons each have different colors, whereas in the FDS version they are all gray. Also, the two dungeon bosses Carrok and Volvagia (the latter being initially named Barba in the NES release) have different graphical appearances. The game over screen in the English version features the silhouette of Ganon from the chest up, with the text saying "Game Over/Return of Ganon", whereas the FDS game over screen is a plain black screen with the text saying "Return of Ganon/The End". There are some slight additions to the dungeons, as well as a handful of differences on the dungeons themselves. Due to an additional sound chip that the Disk System has, when Nintendo ported Zelda II over to the NES, they had to eliminate some musical elements, especially from the title screen. On the main map, the icons denoting attacking monsters look different, but the most significant change is the spending of experience points, as Link's three attributes cost the same, unlike the worldwide release. Further, the game is designed to promote balanced leveling, as the saved game on the disk will only let the levels for the attributes go as high as whatever is set the lowest (e.g. if Life is at 5 and Strength is at 4, but Magic is at 1, then the saved game will reflect all as level 1), while still saving the data regarding crystals that have been placed and items that have been collected. These differences make leveling up in the game very different. The Adventure of Link was re-released in 2003 on The Legend of Zelda: Collector's Edition disc for the GameCube, and again in 2004 as part of the Classic NES Series" for Game Boy Advance, with minor changes. The intro text was changed to read "third Triforce" rather than "No.3 Triforce" and the copyright date was altered to read "1987–2004 Nintendo". The death animation removed flashing colors in an effort to prevent seizures, replacing it with a solid red color. There were also various graphical and audio tweaks. It was released as the 100th title on the Wii's Virtual Console in Japan on January 23, 2007, in Europe and Australia on February 9, 2007, and was released in North America on June 4, 2007. The text changes were not made in this version, but it does feature the solid red color in the death animations from the GameCube and Game Boy Advance versions. The Adventure of Link was re-released again on the Nintendo 3DS's Virtual Console in September 2011, alongside the first Legend of Zelda game, as part of the "3DS Ambassadors" program. It was one of ten NES games for owners who purchased their 3DS consoles before the price drop. It was later made available for all 3DS owners in Japan on June 6, 2012, in Europe on September 13, and in North America on November 22. The Adventure of Link was also re-released on the Wii U's Virtual Console in September 2013. Upon its release in North America, Zelda II became one of the most popular NES games of 1988, with many retailers reporting that the game was selling out that year. The game ultimately sold 4.38 million copies worldwide. In 1987, Famicom Tsūshin (now Famitsu) gave it a score of 36 out of 40, based on a panel of four reviewers giving it ratings of 8, 10, 9 and 9 out of 10. This made it their second highest-rated game of 1987, behind only Dragon Quest II. These were also the only two games to have received a Famitsu score of 35/40 or above up until 1987. Play magazine praised the unique gameplay, saying that "it's this combination of unique elements that creates an action-RPG experience unlike any other". Nintendo Power said that the game was "an entertaining and natural step in the franchise's evolution," and awarded it their Game of the Year Award for 1988. Zelda II was reviewed in 1992 by issue #2 of Total! magazine, where it received an 82% rating, due in great part to mediocre sub-scores for music and graphics. A 1993 review of the game was printed in issue #198 of Dragon by Sandy Petersen, in the "Eye of the Monitor" column. Petersen gave the game 3 out of 5 stars. Zelda II was rated the 110th best game made on a Nintendo System in Nintendo Power's Top 200 Games list. In August 2008, Nintendo Power listed it as the 12th best Nintendo Entertainment System video game, describing it as a radical and refreshing departure from its predecessor. IGN said that the game is a "recommended and playable adventure" but also said, "don't expect the same gameplay from the truly classic Zelda titles." 1UP.com praised the game's length, citing that "you can certainly find plenty here to keep you busy for some time." The game also received some criticism. GameSpot said that while the game is "decent enough to make it worth the $5 price [on the Wii's Virtual Console]", it features "questionable design decision[s]" and can get confusing if players don't have the help of walkthroughs. The GBA version of the game had an aggregated score of 73 on Metacritic. and an aggregated score of 68.88 on GameRankings, making it the game of the series with the lowest score in both websites. Many elements first introduced in this game have remained in the series. For instance, non-player characters (NPCs) were present in The Legend of Zelda, but their role was rather limited. Starting with The Adventure of Link, Zelda games have prominently featured a variety of NPCs who play pivotal roles in Link's quests. Zelda II was also one of the first games where NPCs walked around and seemingly had their own agendas, giving the world a life of its own rather than being a simple stage for the story to unfold. The use of metered magic and spells has also carried over into other Zelda games. The Triforce of Courage makes its first appearance in The Adventure of Link and plays an important role in later Zelda games, as it is strongly associated with Link. Dark Link is a version of Link's Shadow which appears in Ocarina of Time, a similar Link clone called Shadow Link appears in Four Swords Adventures, and yet another appears in Spirit Tracks, as well as in A Link Between Worlds. Additionally, The Adventure of Link was one of the first games to combine role-playing video game and platforming elements to a considerable degree. Over the next few years, a number of Japanese-made games appeared with a similar format; major titles such as Cadash (1989) closely resemble The Adventure of Link, with side-scrolling platform stages supplemented by RPG-like statistical systems, weapons, armor, magic spells, and so forth. Most of the sages in Ocarina of Time bear the same names as towns from The Adventure of Link (Rauru, Ruto, Saria, Nabooru, and Darunia; excluding Impa). Another town, Mido, is also the name of a character in Kokiri Forest. However, in the in-game chronology, the towns were named after the characters. The Adventure of Link is also the only Zelda game of the main English releases not to use "The Legend of Zelda" in its title, the only Zelda game to feature "lives" counting down, and therefore the only game in the series to include 1-up dolls. The next Zelda game released after The Adventure of Link was The Legend of Zelda: A Link to the Past for the Super Famicom in 1991, which follows new Link and Zelda characters and returns to the top-down style of the original. There are a small number of side-scrolling areas in The Legend of Zelda: Link's Awakening; these areas were mainly underground tunnels and caves. The series broke away from the top-down style again in 1998 when Ocarina of Time was released on the Nintendo 64, with 3D graphics. A new version of the composition "Temple", arranged by Shogo Sakai, is featured in Super Smash Bros. Melee, where it is played during the "Hyrule Temple" stage and the "Underground Maze" level. A variation of the track, as well as a new version of the "Grand Palace" level song, also appears in Super Smash Bros. Brawl. The track was later once again updated and appeared twice, as the "StreetPass Battle Theme" as well as a slower version for the "Battle Victory" music, in the Nintendo 3DS game A Link Between Worlds, making it the only subsequent Zelda game to include theme music that originated in The Adventure of Link. The StreetPass battle mode is itself inspired by the final boss fight of Zelda II; StreetPass fights occur between one player as Link and the other player as Shadow/Dark Link. Zelda II was also very influential to other NES games like Faxanadu, Moon Crystal and The Battle of Olympus. Moreover, the Adventure Time: Hey Ice King! Why'd You Steal Our Garbage?!! title, developed by WayForward Technologies, was intended to play like Zelda II and pays homage to it. It features very similar gameplay and references to the Zelda series. ^ "「リンクの冒険」全てのゼルダの最終章？最も未来を描いた名作横スクロールアクションアドベンチャー！「ニンテンドークラシックミニ ファミリーコンピュータ」収録記念！【ゲーム年代史】". Excite (in Japanese). ^ Wong, Alistair (August 5, 2018). "The Legend of Zelda: Breath of the Wild Has Been Added To The Series' Official Timeline". Siliconera. Retrieved August 5, 2018. ^ a b c d e f g h Nintendo (1 December 1988). Zelda II: The Adventure of Link. NES. Nintendo. ^ a b c d e Zelda II: The Adventure of Link instruction manual. Nintendo. 1 December 1988. ^ Nintendo Co., Ltd (January 14, 1987). The Legend of Zelda 2: Link no Bōken. Disk System. Nintendo Co., Ltd. Several years after Gannon was destroyed, Link learns from Impa about another sleeping Princess Zelda. ^ "Shigeru Miyamoto Interview". Super Play (in Swedish). Medströms Dataförlag AB. April 2003. Retrieved February 1, 2014. ^ a b c Nintendo Co., Ltd (December 1, 1988). Zelda II: The Adventure of Link. Nintendo of America Inc. Scene: staff credits. ^ "Classic: Zelda und Link". Club Nintendo (in German). Nintendo of Europe: 72. April 1996. ^ "Mario Kart: Double Dash!! – the Interview!". ComputerAndVideoGames.com. Future Publishing Limited. November 3, 2003. Archived from the original on July 8, 2011. Retrieved July 8, 2011. ^ Famicom 20th Anniversary Original Sound Tracks Vol. 2 (Media notes). Scitron Digital Contents Inc. 2004. SCDC-00318. ^ "NES Review: Zelda II: The Adventure of Link. The hero returns in 8-bits, this time to tackle side-scrolling!". Video Games Blogger. 10 September 2006. Retrieved 2008-04-06. ^ "New Famicom Mini Series to see legendary Disc System titles reborn". Spong. 6 July 2004. Retrieved 2008-04-06. ^ "The Legend of Zelda Collector's Edition". GameSpot. Archived from the original on 2007-03-23. Retrieved 2007-01-15. ^ "Classic NES Series: The Legend of Zelda". GameSpot. Archived from the original on 2007-03-25. Retrieved 2007-01-15. ^ "Zelda II to be 100th Nintendo Wii VC Title". Video Game Generation. Archived from the original on 2007-09-27. Retrieved 2007-06-01. ^ "Japan Gets New Wii VC Titles For January". Gamasutra. Retrieved 2007-01-15. ^ "Wii-Kly Update: Four New Classic Games Mark Wii Shop Channel Milestone". MCV. 4 June 2007. Retrieved 2008-04-01. ^ Phillips, Tom (September 1, 2011). "How to get your 3DS Ambassador games". Eurogamer. Gamer Network. Archived from the original on May 18, 2016. Retrieved September 13, 2016. ^ Bivens, Danny (May 30, 2012). "Zelda II Coming to eShop in Japan Next Week". Nintendo World Report. NINWR, LLC. Archived from the original on September 13, 2016. Retrieved September 13, 2016. ^ McFerran, Damien (September 10, 2012). "Nintendo Download: 13th September 2012 (Europe)". Nintendo Life. Gamer Network. Archived from the original on September 6, 2015. Retrieved September 13, 2016. ^ "Zelda II - The Adventure of Link". Nintendo of America. Archived from the original on August 7, 2016. Retrieved September 13, 2016. ^ Nunneley, Stephany (September 12, 2013). "Nintendo downloads North America – The Wonderful 101, Toki Tori 2+, Zelda 2: The Adventure of Link". VG247. Videogaming247 Ltd. Archived from the original on April 29, 2016. Retrieved September 13, 2016. ^ Cook, Dave (September 23, 2013). "Nintendo downloads EU: FIFA 14, Zelda 2 & Soul Hackers lead the week". VG247. Videogaming247 Ltd. Archived from the original on March 31, 2016. Retrieved September 13, 2016. ^ "Zelda II: The Adventure of Link". GameRankings. Retrieved 2014-01-11. ^ a b "Classic NES Series: Zelda II - GBA". GameRankings. 1 January 2008. Retrieved 2008-04-06. ^ a b "Zelda II: The Adventure of Link (Classic NES Series)". Metacritic. Retrieved 2008-04-01. ^ "Zelda II: The Adventure of Link - Review". Allgame. Archived from the original on 2010-02-16. Retrieved July 25, 2013. ^ a b Parish, Jeremy. "Zelda II: The Adventure of Link (Classic NES Series) (Game Boy Advance)". 1UP.com. Archived from the original on 2004-12-04. Retrieved 2008-04-01. ^ a b Petersen, Sandy (October 1993). "Eye of the Monitor". Dragon (198): 57–60. ^ a b "Famitsu Hall of Fame". Geimin. Retrieved 7 February 2012. ^ a b Alex Navarro (5 June 2007). "Zelda II: The Adventure of Link". GameSpot. Retrieved 2008-04-06. ^ a b Harris, Craig (26 October 2004). "Zelda II: The Adventure of Link". IGN. Retrieved 2008-04-01. ^ a b "Zelda II: The Adventure of Link review". Nintendo Power: 150. ^ a b "Zelda II: The Adventure of Link review". Play Magazine: 100. ^ Parton, Rob (31 March 2004). "Xenogears vs. Tetris". RPGamer. Retrieved 2008-04-06. ^ Jarratt, Steve. The Adventure of Link: Zelda II. Total!. Issue 2. Pg.22-23. February 1992. ^ "NP Top 200". Nintendo Power. 200. February 2006. pp. 58–66. ^ "Nintendo Power - The 20th Anniversary Issue!". Nintendo Power. 231 (231). San Francisco, California: Future US. August 2008: 71. ^ "Retrospective: Zelda II: The Adventure of Link". IGN. 14 April 2006. Retrieved 2008-04-06. ^ "The Gamasutra Quantum Leap Awards: Storytelling (Page 3)". Gamasutra. November 3, 2006. Retrieved 2015-01-11. ^ "Mega Mirror: Help your elf". Daily Mirror. 6 February 1999. Retrieved 2008-04-01. ^ Thomas, Lucas M. (4 June 2007). "Zelda II: The Adventure of Link Review". IGN. Retrieved 2008-04-06. ^ Scalzo, John (28 June 2007). "Zelda II: The Adventure of Link". Gaming Target. Retrieved 2008-04-01. ^ Thomas, Lucas M. (22 January 2007). "The Legend of Zelda: A Link to the Past VC Review". IGN. Retrieved 2008-04-01. ^ "Hidden Gems: The Rest of the NES". 2016-03-05. Archived from the original on 2016-03-05. Retrieved 2018-08-21. ^ "Adventure Time 3DS: Zelda II in the Land of Ooo". IGN. ^ Originally released in Japan as Link no Bōken (Japanese: リンクの冒険, Hepburn: Rinku no Bōken). 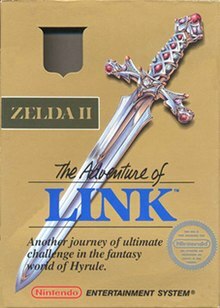 The full Japanese title varies between sources: while the Japanese packaging features the subtitle The Legend of Zelda 2 written in English above the main Japanese title, a TV ad for the game instead refers to the game as Zelda no Densetsu – Part 2: Link no Bōken (ゼルダの伝説パート2 リンクの冒険, Zeruda no Densetsu Pāto Tsū: Rinku no Bōken). This page is based on the Wikipedia article Zelda II: The Adventure of Link; it is used under the Creative Commons Attribution-ShareAlike 3.0 Unported License (CC-BY-SA). You may redistribute it, verbatim or modified, providing that you comply with the terms of the CC-BY-SA.